Can’t get to a Pietasters gig, but dying to get some Pietasters merchandise? Well, we’ve got some good news! We’re happy to finally announce that our website store is now live! We’ve got t-shirts available, as well as physical copies of our 2007 album All Day (CD) and our 1999 album Awesome Mix Tape #6 (Vinyl). Additionally, we’ve got a DVD featuring a live performance at the 9:30 Club in Washington D.C., along with some interviews and commentary. More merchandise will be added to the website store in the future. 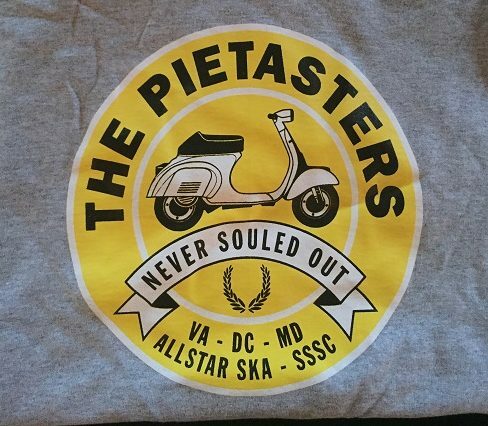 Visit our Shop page to check out our stock, and thanks for supporting The Pietasters! It states that shirts are available in 2x but won’t let you choose it on the drop down menu. Please advise as I’m interested in grabbing one of each. I assume you are seeing that in the ‘Additional Comments’ section, yes? We’re currently out of stock of 2XL shirts, but we’ll look to order more very soon. Sorry for the wait! Please stock more 2XL for us fat guys!!! We hear ya! We’re looking to order more as soon as we can. Sorry for the wait!